I’ve been down in the dumps, well training-wise, as I felt too lazy to run. I missed 2 big running events (Pasig 10-10-10 and Camsur) and I felt like I haven’t been that active in my running group as well. I even felt worse when I wasn’t able to register for the upcoming Adidas King of the Road. I was looking forward to joining my adination running family in this run. 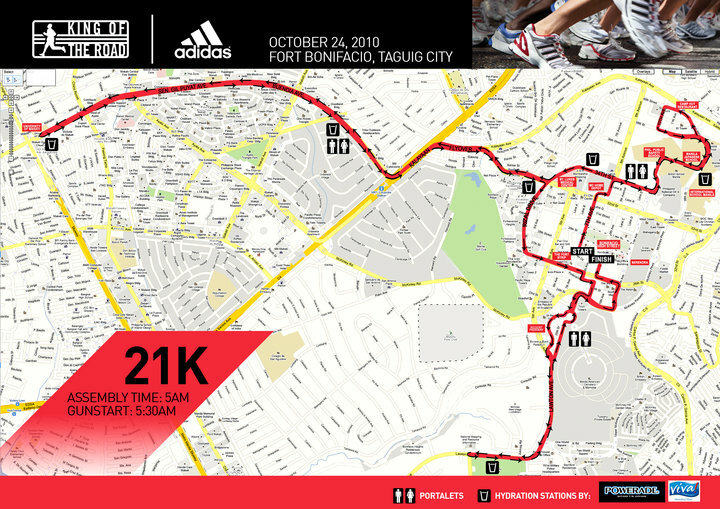 But even with a hefty price tag (P850 – reg fee for ALL distances), it sold out faster than Papa P’s 10k PR. Noooo! I want my Adidas KOTR medal (*sniff*). Sadness consumed me. Will I ever get my running mojo back? Alas, I received great news from Jean of Adidas, or from the race organizer…not sure but let’s call her Jean, my fairy Godmother. She sent me an SMS aying that my 21k race kit is ready and that they can deliver it tonight! This was so unexpected. Of course, I was jumping up and down with joy. Then I realized, I am so not ready for this race! My last 21k was Sept 5 during the Disney HM and I felt so out of shape. Yikes! With just 3 days to go til D-Day, I now wished that I didn’t wish KOTR. Gulp! Wish me luck! I need every bit of it.